Aug 28, 2013 - S.D. Hello! My name’s Shoumai. Here’s my story! If you have been thinking about including your dog in some of your water activities, you may want to consider training your dog to join you on your rowboat, power boat or sailboat. To keep you and your dog safe the steps are the same. 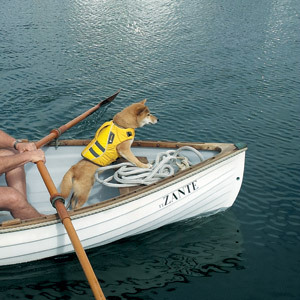 A case in point is a friend, George, who loves rowing his boat in San Diego Bay, decided that he would like his dog to join him on the rowboat. 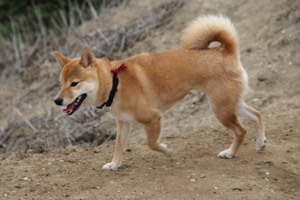 His dog, Shoumai, is a 2 year old shiba inu, a Japanese breed that is one of the most ancient dog breeds in the world. Shoumai, a Japanese word meaning “Little Sister,” is a small but muscular dog weighing about 18 pounds. She likes to play along the seashore -- loving Fiesta Island and Coronado’s dog beach, but whether she would behave safely in an rocking rowboat was not known. Even if you are an excellent swimmer, you need to carry a life preserver for yourself and your dog. 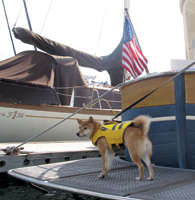 In a chaotic, unexpected situation on the water, it is safer for you and your dog to purchase a dog life preserver (yes, there are life preservers for dogs!). That way if there were ever a problem, e.g. the dog jumping out of the boat or the rowboat tipping over, you would know that your dog would be safe and should stay afloat long enough to be retrieved. 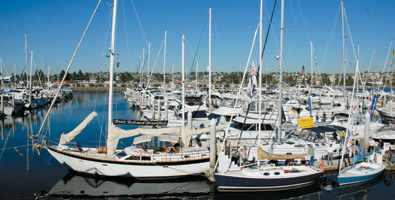 West Marine in Point Loma carries several types of life preservers in multiple sizes. 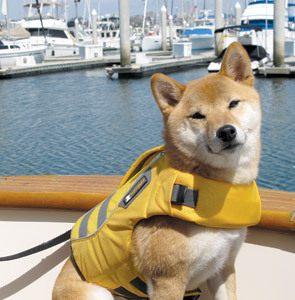 Finding the right life preserver that fits your dog comfortably is somewhat of an exhausting process because the dog needs to try on several styles in various sizes. That means you should bring you dog to the store to try on the life jackets. In Shoumai’s case, she is difficult to size because she is small but her body and neck are quite muscular and thick. Eventually, the choice was one of the Ruffwear models, the K-9 Float Coat, the Cadillac of dog gear at $79. Swim in the Life Jacket Next, the dog needs to feel comfortable in the life jacket (or at least not uncomfortable) and be able to swim and stay afloat while wearing the life jacket. Canine to 5 on Morena Blvd. 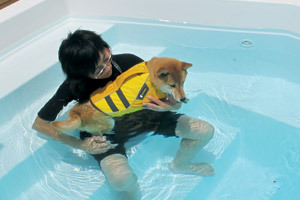 has a warm water doggie pool where owner, Hiromi Suzuki, exercises dogs in a calm, supportive manner. Suzuki is an amazing dog trainer and runs a training school and doggie day care. 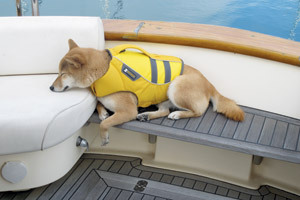 So with Shoumai in her life jacket Suzuki carefully and tenderly put Shoumai in the pool and then walked her around slowly to build the dog’s confidence. 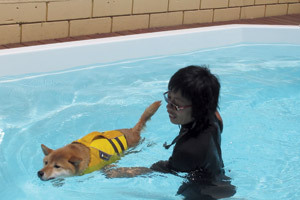 After a while Suzuki guides the dog to begin swimming laps in the pool. After several laps, the dog improves her swimming technique after getting used to the life preserver which puts the dog higher in the water and changes her center of gravity. Overall Shoumai did very well swimming using her four legs and her tail for balancing – she displayed a very respectable doggie paddle technique. Note: Some dogs are afraid of the water which would require several sessions in the doggie pool to overcome fear and develop swimming skills. All this fun at the Sunroad Marina, Harbor Island. Uh-oh! That water looks a lot bigger than the pool! Now it’s time for the maiden voyage. George is an avid rowboat enthusiast and has rowed for many years, preferring the classic rowboats from Whitehall Rowboats in Victoria, B.C. He maneuvered the rowboat close to a dock in Sunroad Resort Marina on Harbor Island. Shoumai jumped into the rowboat and the two were off. At first Shoumai seemed a bit perplexed by the whole scene but soon took a seat on the bow of the boat. After fifteen or twenty minutes, George thought that perhaps this was long enough for the maiden voyage and allowed her to disembark. However, after the rowboat pulled away from the dock and started down the channel, Shoumai began crying – she wanted to get back on the rowboat! Clearly the training steps had paid off. So Shoumai went for a second ride that afternoon entertaining all the nearby boaters in the marina. Now George has a regular rowing partner that he can rely on (no cancellations at the last minute). However, this partner won’t help with the rowing.